Sunday has already arrived, it doesn't feel like another whole week has been and gone. Spending all of my time with Romy really makes the days go by that much more faster. We generally start our week off with Luke as Mondays & Tuesdays are his days off work. I generally love Wednesdays because they are half way through the week, but now they have taken on that typical Monday feeling. On Wednesday, the day we dread the most, Romy & I visited some friends & had an afternoon movie marathon at home. 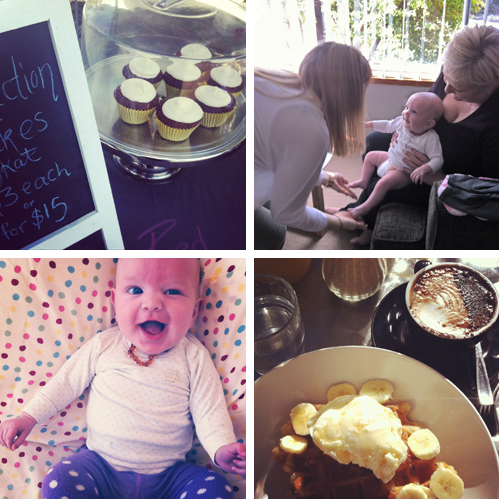 And on Thursday had a morning coffee date & went for a walk with my friend Renee & her baby boy Oscar. Friday Romy & I ran errands and got organised so we could spend the weekend with my Sister & her husband Allan. Before my Mum & Sister Ashleigh came over on Saturday morning, Luke & I got up early to go out for breakfast together and check out the markets. Because Luke spends most of his time at work and we get limited time all together to do things, we're now making more of an effort to do morning adventures. I hope I don't jinx it, but Romy has been sleeping fantastically the last few evenings, so I have been able to catch up on a couple of things and a lot of sleep. This morning we had breakfast with Ashleigh & Allan before they went back home, and it was such a beautiful morning to have coffee and waffles in the sun. Luke & I are finishing our week off with pizzas, drinks and a visit from an old friend. I hope you all had a lovely week too!